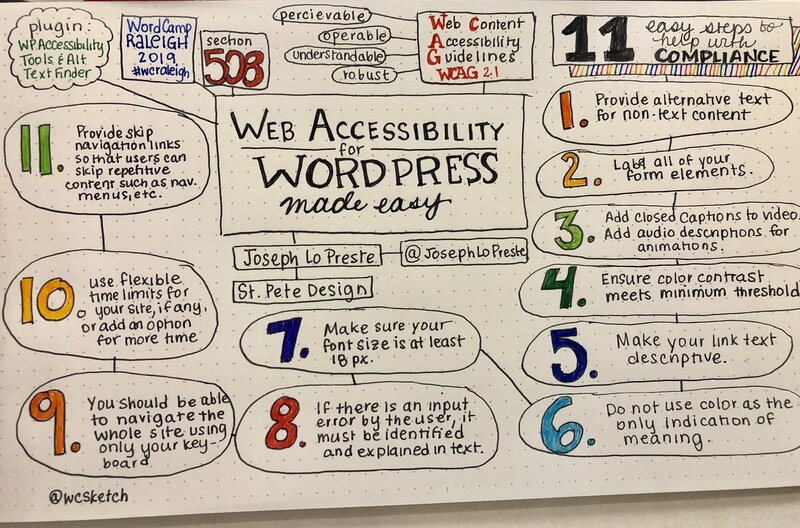 At StPeteDesign we have a passion for Web Accessibility when it comes to WordPress websites and software. Let our Section 508 Consultants help your company become compliant. Not only will you avoid costly lawsuits, but together, we can actually make a difference for people with disabilities! In 2017 we attended the National Federation of the Blind National Convention in Orlando, Florida. While we were there we learned not only about Section 508 compliance but we learned about the difficulty that the visually impaired community has with navigating the internet. We bring a unique set of skills and mindset to your companies Section 508 compliance that’s because we where WordPress developers first. Our passion began with creating WordPress websites and plugins. Then that passion grew to include helping 100’s of millions of disabled people with Web Accessibility. We decided that we were going to take our Web Development skills and combine that with the knowledge and insight about web accessibility that we’ve gained and use that to make a difference! When you are able to combine your passions with your skill set, amazing things will happen. We believe that this is exactly what is happening right now. There has been a push to increase the usability of the internet for people with disabilities and companies are responding by making their websites ADA Section 508 compliant. 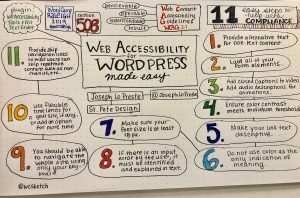 If you follow these Section 508 guidelines then your WordPress website or WordPress software will be so much easier to navigate for a disabled person especially a low-vision user and you won’t have to worry about lawsuits. We take for granted things like the internet that unlock so much knowledge for us on a daily basis. Our passion is not just about making your website “Section 508 compliant”. We want to make amazing WordPress websites or plugins for people who are visually impaired to access and navigate with ease. We want to make the web accessible to the estimated 253 million people that live with a vision impairment, one accessible WordPress website at a time and one accessible WordPress plugin at a time. We are committed to creating a great user experience when it comes to a low vision individual navigating your website. As part of that commitment, we have created a free WordPress plugin that helps your site become ADA Section 508 compliant by allowing you to very easily add a descriptive “Alternative Text” to all of your pictures on your website. You can add this Alt Text either 1 picture at a time or all the pictures at the same time with 1 click. We also include things like an Auto Accessibility Testing Tool, Contrast Ratio Checker, WCAG 2.1 Checklist and some great Resources for you to learn much more about web accessibility. Learn from our human diversity. Using that knowledge to create accessibility for all people, not just the average person. We also believe if we approach these opportunities with this mindset, we will be able to better solve the growing problem we recognize as WP developers. That is, to make WordPress software and websites accessible to all people who need it to effectively navigate the internet. That means a huge percentage of the world can be positively affected or negatively affected depending on how WP developers like us and companies like yours move forward with this very important task. If we all do our part, we will be able to make a difference! The Americans with Disabilities Act (ADA) standards was published by the Department of Justice (DOJ) in September 2010. The Compliance Standards are stipulated in Section 508 of the Rehabilitation Act of 1973. These standards state that all electronic and information technology to be made accessible to people with disabilities. 508 compliance requires all entities with “places of public accommodation” to provide website and app accessibility to people with disabilities. When all the federal sites comply with these regulations, they become not only accessible to all users but also become compatible with assistive technology, such as screen readers. You can find the actual Section 508 recommendations if you follow the link for the United States Access Board. All government institutions who have a website or any software. Also, any contractors who deal directly with the federal government. Those companies are required to comply with section 508 guidelines and website accessibility standards as stipulated by ADA. We are stressing that, although not required by this law currently, any business owner that would significantly benefit from 508 compliant sites be proactive and meet the guidelines before they actually become law. Even if your site is purely consumer-based and 508 compliance is not a requirement for you, you can reach out to all your potential customers by creating an ADA section 508 compliant WordPress website. The people with disabilities make up a large number of consumers and is an underserved portion of our community. There are over 213 million people with some sort of Vision disability. This is a potentially huge customer base with very low competition because there are not many businesses that are providing a website or service that is inclusive of this customer base. SO be on the forefront of this movement. We hate to refer to the disabled community as a potential customer base. But we believe that this is the language that business owners speak and we want to get this message out to as many people as possible. Even if you do not use our services we still would love to talk to you and explain how important web accessibility is to so many people. We want to plant the side of web accessibility in as many business owners or anybody who has anything to do with building websites and software. You can have the most beautiful site with the best pictures and animation. You could have spent $10.000 on your new site selling your amazing product to the world. But to a person with a disability like Low-Vision, it looks like a black screen. The Low-Vision community will not be able to navigate or see any of your beautiful pictures or animation. So it is very important to design your website or software not only for the average person but also for the 100’s of millions of people with a disability. We believe that it is our responsibility as web developers and software developers to create with the inclusive mindset, not an exclusive mindset. I’m 100% sure that developers do not create websites or software with an exclusive mindset but that does not mean that the end product is always accessible to users with disabilities. Many times the end result is a beautiful website the 90% of the world can use and be completely satisfied with the user experience. This makes it harder to recognize that there is still 10% of the world that can not use your website or software. These users at best feel like the user experience left something to be desired. A lot of these users can not use your amazing website or software at all. In our opinion, we feel Google will start to favor sites that are Section 508 compliant. Not that they will start to penalize you if you do not comply with section 508. We think that they will give just a little bit more favorable to the website that is ADA compliant. So if your business relies on your Google SEO rankings to generate business. Then you should really think about becoming section 508 compliant. At the very least start doing some research and start paying attention to what Google says about some updates that are coming. Remember kids, Knowledge is half the battle! Our web development agency strives to provide lasting 508 Compliance website design solutions for the government, federal vendors, non-profit organizations, small businesses as well as the private sector. Our services are aimed at creating a platform that adheres to the rules and regulations of the Disability Act. Ones that will last for a long time. Because we don’t just do the very basics to bring your website into compliance. We have a team that is qualified in web design and well versed with all aspects of all current CMS’s (Content Management System) like WordPress. Also, we have expert web accessibility consultants with WordPress development backgrounds with years of technical insight required when creating or testing Section 508-compliant web-based content. So don’t let just any company go through your website and try to tell you whether you are compliant or not. Let our industry leaders in web accessibility help you become Section 508 compliant. We will go through your site and give you a report on where exactly your WordPress website or WordPress software needs improvement to become compliant. For you to establish or develop a 508-compliant website, you need to have a precise understanding of the accessibility provisions and the experience to translate the raw data into technical solutions. Our staff is well informed on how the disabled people interact with IT and also well versed with the provisions within Section 508 legislation. Equipped with such resources, we will not only establish a website that is friendly to all users but also design a platform that is easily compatible with future developments. We have already created many WordPress ADA Compliant websites for Government Agencies. Along with many Custom WordPress Software specifically for ADA Section 508 Compliance. We are the local authority on this subject. With the increase in lawsuits targeting government businesses, you need to identify a one-stop expert. A WordPress developer who is well versed with disability rights and laws. This includes technology accessibility that includes WordPress websites and Custome WordPress Software. Failing to adhere to the ADA standards or other disability rights laws puts any business at the risk of hefty fines. The lawsuits are starting, they have started to systematically target Government agencies that are eager to settle or can afford the lawyer fees. With our ADA consultants, you will be guided on what precautions to take and the measures to instill in your website to stay safe from unnecessary court fines. Because the lawyers have begun their assault. Be prepared by avoiding them altogether. We will assess all of your images and digital information or any other media file within your website to make certain that your WordPress website contains web accessible content that is ADA section 508 compliant. Besides that, we will verify that all the site visitors have the ability to make orders or shopping and complete online forms successfully according to section 508. This includes making sure that all PDF files are ADA compliant. We want to find the best solution for you that fits all of your needs. We might be able to implement some of our custom WordPress software that is being used by many sites already. We could decide to use a slave site with our custom software that mirrors the content of your original site. The point is that there a lot of options for all the many needs you may have. Lets us at least take a look at your site and then we can give you a detailed idea of how we can help you become ADA section 508 compliant. 11 easy steps to help you become Section 508 Compliant. For years, before the enactment of this law, people with disabilities were largely a forgotten lot. Access to information was a nightmare to a large number of people all over the country. Because the websites were never designed to meet their special needs. In this day and age if you do not have access to the powerful internet you are left with very few options. If you could imagine going without any of your electronics. The phone in our pockets that we all have gotten dependent on to make it through our day. These people have been going there entire life without access to the internet and it is just a shame. There is so much power in the digital world that could benefit the people that need it the most. We want to change that! That is why we created Custom ADA Accessible Software that could open up the world of the internet to the people with disabilities. In an era where equality was stressed, our friends and family members who were suffering from various forms of disabilities. These loved ones were still unable to fully enjoy the benefits of the internet. The hardest hit were the visually impaired and those who suffer from hearing-related conditions. As most companies digitized almost all aspects of their operation. It became apparent to us that necessary measures had to be taken to make websites accessible to all. We were stunned when we went to our first Nationa Federation of the Blind National Convention 2017. I take for granted the ability for me to use the internet at will let alone all the other major issues that they deal with on a daily basis. That was also an awaking for to me to realize how attached to my phone and computer I was. Not only is the internet great for fun and entertainment. I actually would not be able to run my company or do some of the other things I do now without the internet. With the growth of the internet and the transition to the digital world. We need to make sure we don’t forget about the people with certain disabilities that are not able to even log in to an email. America, in particular, is really pushing hard to digitize everything. I am a business owner and there are 3-4 government agencies that I deal with, that communication with them or all of the paperwork I need to fill out has to be done on the internet. These Government agencies are 100% digitized and while that is not a problem for me. We are leaving out a large number of people with handicaps that meet keep them from getting on the internet. By digitizing everything these Government Agencies have made it increasingly difficult to even access the basic services from government agencies. Section 508 of the constitution was enacted in 1990 to eliminate this preexisting discrimination that was a major hurdle in access to information by those living with a disability. The law aimed at ensuring equal employment opportunity for all. This piece of legislation has however undergone amendments over the years. In 1998 an amendment was made to the Rehabilitation Act making it a mandatory requirement that all Federal agencies make their websites accessible to people with disabilities. This is where we queue the lawyers. Law offices have gotten into the arena of ADA Section 508 compliance. These lawyers have targeted Government agencies for not making the websites section 508 compliant. But make no mistake this is only the beginning. Once the lawyers eat all the easy fish in water. They will start to go after corporate America. They will start by suing the larger corporations that have the money to pay the lawyer fees and make them go away. Again, when those fish are all gone then the only fish left will be the mom and pop business that can not afford to completely redo their website. I am a small business owner and the thought of having to hand over thousands of dollars at a time that we are struggling might just put me out of business. But rest assured there are lots of options to keep you from this scenario and those options are what we specialize in. The word Section 508 Accessibility Compliance refers to Section 508 which comes under the Rehabilitation Act. This act is a federal law that will make it illegal for federal agencies to remove the people with disabilities. It is absolutely making the US federal government agree to a deal with the standards which are for the Americans with Disabilities Act. It is known also as ADA. It is expected that all electronic communications and information technology systems provided by the federal government will also be employed by handicapped or disabled people. It includes the computer and the internet access of the federal government. The ADA Section 508 compliance has a great importance for computer manufacturers as well as the companies that are supplying the computers to the Federal Government. It is under this section that all the computers, as well as computer equipment, that will come to the federal government. They must also be accessible to the handicap accessible. Video or multimedia products, telecommunication products, and operating systems. Basically, the entire internet comes under this Section 508. As the technology gets more advanced then the standards will also be increased. This means that all the companies that are selling computer technology or software to the federal government must give assurance of meeting the standards. These standards are from the ADA Section 508 compliance legislation. All the products dealing with the information and technology will be considered under the Section 508 accessibility. This means that a lot of software and information items that are sold by contractors to federal agencies must also meet the Section 508 Standards. The federal agencies are considering the standards of the US General Services Administrative’s Center. There is another aspect of Section 508 is that many contractors, as well as IT providers, will be unaware of the government’s website. They must also comply with the Section 508 standards. It has the vast meaning of the website accessibility compliance, which is very important to the contractors that are designing as well as maintaining. This maintenance is of federal websites. Any of the websites that are created for the use of the United States Government needs to meet or exceed the standards of the Website Accessibility Compliance Standards. These are made by USGA. Software, as well as software applications designed for the federal websites, will be screened for Website Accessibility Compliance. Companies that are unable to fulfill the standards will not get any federal contracts for designing software or websites. Nor will they take part in or work for the government as a contractor for designing software and websites. Every firm that has the urge of providing IT service, web design, software, and other computer services to the federal government needs to understand Section 508. They must be aware of and capable of dealing with the Section 508 Compliance. Here at StPeteDesign, we want to bring our passion and knowledge of section 508 compliance to the digital world. We want to make it much more accessible to the people with disabilities that struggle with the new online world we all live in. We have the ability to completely build you a new beautiful website. We also have the ability to add a few of our Custome Software Packages to help bring your site up to the legal minimums that make you compliant. But like we have mentioned before. We want to do more than to just provide the basics to you and your customers. We truly have a passion for creating robust Custom WordPress Software that makes your website easy to use for the people with disabilities. At the same time helping people with disabilities that are trying to use the internet. Don’t forget, the disabled community are consumers as well and to be honest, not too many businesses cater to there needs. So if you have an online business, you are missing out on a large number of people that could benefit from your services. Get Our FREE Custom ADA Section 508 WordPress Plugin! Every dream envisioned begins with a first step…..
Our first step – [A Free Web Accessibility Tool For WordPress Developers]. We’ve been working hard on bringing web accessibility to the internet one site at a time. So we are very excited to announce our FREE custom plugin available through the WordPress repository.